In my last blog I introduced a joint piece of work that I am leading between Universities UK and UKCES, which looks at how employers and universities are working together to create alternative pathways to higher level skills, ensuring UK talent can compete on an international scale. Thanks to everyone who engaged in the debate around the blog. One message that came through strongly was that collaboration between employers and universities can have far-reaching benefits for all involved, beyond the students and employers. This might be, for example, in the form of workforce development opportunities for the employer’s current workforce and the wider sector. An example of this is the National Centre of Excellence for Food Engineering, between The Food and Drink Federation and Sheffield Hallam University. This involves collaboration between a Trade Association and Sector Skills Council working together with industry and academia to create an innovative skills solution. The Centre of Excellence acts as a sector hub to develop the skills of those working in all areas and the food and drink industry, which is the UK’s largest manufacturing sector. This affirms that university/employer collaboration can take many forms and in so doing offers a range of benefits. Attendees also discussed some of the barriers they believe prevent collaboration, and they highlighted the false divide between academic and vocational routes. Whilst traditionally these two pathways may have been seen by some as completely separate, attendees felt that this is not the case. A good example of this is the creation of higher apprenticeships, which defy this divide by being both vocational and academic at the same time. For example, Cogent’s range of higher apprenticeships in life sciences provide hands-on experience of working in laboratory, scientific and technical roles, with the opportunity to gain qualifications up to graduate level. With changes in tuition fees funding, students may increasingly look to universities to provide them with something more than the traditional three year degree, and institutions are re-evaluating their offer. University representatives predicted that universities may therefore increasingly need to consider the input of employers and the importance of giving students real-life experience and industry relevant skills. This change is beginning to occur, however this false divide must be continually challenged in order to encourage more and better collaboration. Finally, I was interested to hear both parties say that collaboration could be better promoted by raising its strategic profile and importance. Although there is a lot of activity going on between committed individuals, it does not always join up at this more strategic level. Employers mentioned that Industrial Partnerships, such as the Energy and Efficiency Industrial Partnership led by National Grid, could be a way to encourage joined-up thinking. Employers expressed a desire to take end to end responsibility for skills development in their sectors and to consider together where higher level skills gaps are and how to address these with universities. This type of action is necessary to build collaborations at the institutional – as well as the individual - level. These important insights will inform our ongoing field work and we will keep the discussion of these issues going with activities throughout the year, with our final report being launched in the autumn. Following my last blog we received a great response from organisations involved in innovative collaborations, and these helped shape the focus for the research. Today and tomorrow we’ll be asking for people with first-hand experience of these main issues to share their views. 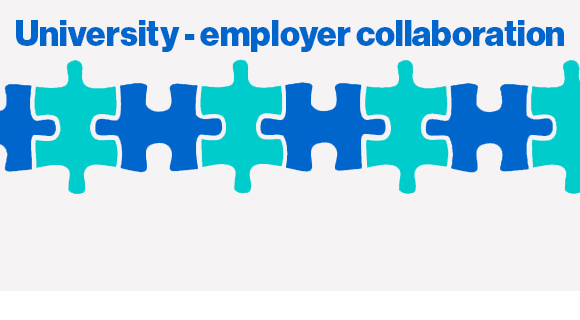 Have you experienced the wider benefits of university-employer collaboration? Do you perceive a divide between the vocational and the academic – and if so, do you think this needs to change? And how do you think collaboration could move from being between individuals to being joined up at a higher level? Join the debate – follow @ukces and @UniversitiesUK and use the hashtag #forgingfutures, or if you want to share more detailed views, go to LinkedIn. Viridor would be interested in talking to you further regarding the join up between universities and employers. Please can you contact me to discuss?